My therapist, Rebecca Crabb, normally adopts a neutral stance. But this week, as I left her office, she seemed to be moved emotionally by what I had shared about my struggles with wanting to be recognized as a “great man,” as my mother repeatedly assured me I would be. As I said goodbye, Rebecca commented, “Keep up the great work.” Her use of the word “great” may or may not have have been intentional. Regardless, it prompted me to reflect more on the word. Can someone be a “great” person? If so, what does that mean? Is everyone created “equal” in the eyes of God? If so, how do you reconcile that notion with the belief in greatness? What percentage of the population can be great persons? If someone is a great person is that person “superior” to others? Does greatness depend on excelling in a particular skill? Does greatness depend on being recognized by others as great? Can ego and ambition fit with wanting to be great? In response only one person “liked” the post, though one other did comment, “Good thinking, Wade.” That response leads me to believe that few people felt that my post posed important, thought-provoking questions that are difficult if not impossible to answer. “People created in the likeness of God” mean having equal access to Godly character traits, like love, honesty, humanity, truth, justice, kindness, etc –nothing to do with “greatness.” Greatness cannot be aspired to, but occurs when one is recognized by peers as having made use and application of inherent character development well above normal in ways that advance humanity over personal fulfillment. In my opinion just about everyone has something inside of them that makes them great. We all have something great about us, something that makes us uniquely who we are. One person’s greatness doesn’t have to negate another’s. Rather I think that we should all strive to appreciate the greatness in ourselves and in each other. I cannot see a clear, easy answer to those questions. I am “better” than others with regard to certain skills. but that does not necessarily make me a better person. I may generally be a more moral person because I am less selfish, but that does not diminish the inherent equal worth of others. I can justifiably aspire to be recognized for having maximized the compassionate use of my talents, limited as they are, but I do not need to be recognized in order to be a great person. Yes, we need to recognize the greatness in others, while also recognizing their weakness. Emerson, I believe, said that one is great if one is true to who they really are. All of us fall short in that regard, at least from time to time, but some more so than others, at times admittedly so. Ajahn Amaro once told me to accept praise as “icing on the cake.” But sometimes it becomes the cake. I think greatness happens when people are exceptional in some way – they share ideas that many people want to hear, they help usher in change that is sorely needed, or bring delight to many people. Or, a person can be great to just one or two people. Like someone may be a great dad or brother or friend. They were there for you and gave you what you needed to make your life better or they lead by example. That’s how i think of greatness. We all have differing perceptions; but, there are some people who many people agree are or were great people. Like Mark Twain, Abraham Lincoln, Susan B Anthony, Noam Chomsky, etc. Today, I still feel that those comments don’t get at the dilemma that bothers me. So I posted the following new status update, which approaches the paradox from another perspective. The best way to love oneself is to love others. To give is to receive. Being willing to die for another is the ultimate expression of self-love. But that benefit to the lover is most rewarding if it is a by-product. If we give in order to receive, the benefit is diminished. And when we love others, it is easy to anticipate the ultimate self-benefit and become self-centered rather than other-centered. Self-awareness, which makes humans uniquely human, is a blessing and a curse. It is a rich source of creativity and growth, but it easily leads to chronic self-centeredness, which is deadly. Resolving this contradiction is a constant struggle. If someone is a great friend to “just one or two people” and they are true to who they really are, then perhaps they are a great person — in which case they are not great because they “bring delight to many people.” How we define “greatness” is critical. Yes, everyone has “greatness” within. But how many come close to fulfilling it? The first definition of “great” in Webster’s includes the synonym “ample,” which is defined as “generous or more than adequate in size, scope, or capacity.” That sense of the word may be a good starting point. An organizer I hold in high regard recently asked me my opinion about the Metta Center for Nonviolence Roadmap. Following is my response. to promote the transition to a nonviolent future by making the logic, history and yet-unexplored potential of nonviolence more accessible to activists and agents of cultural change (which ultimately includes all of us). 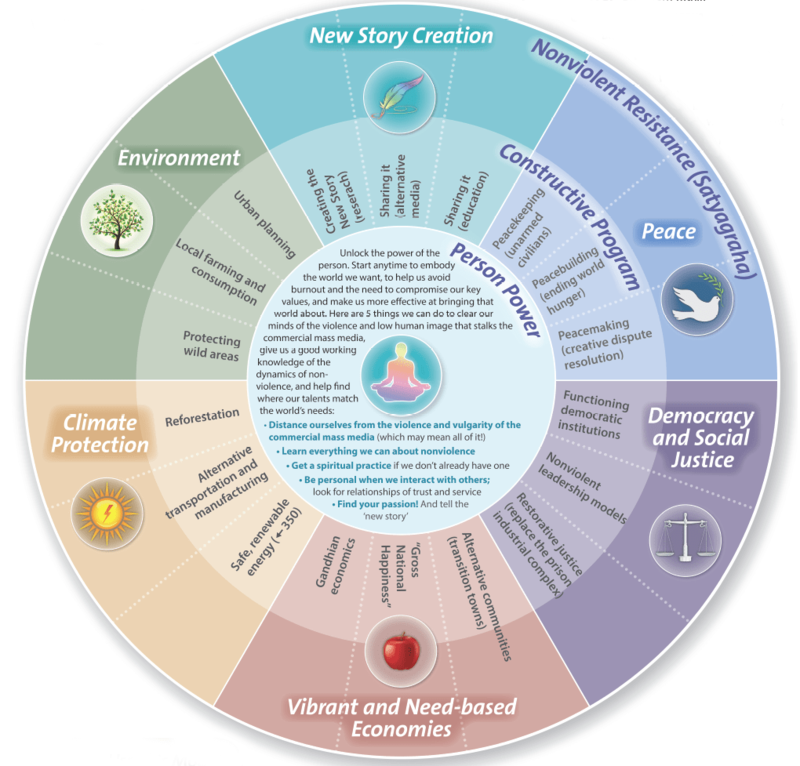 We help people in any walk of life discover their innate capacity for nonviolence and use it more strategically for long-term transformation of themselves and the world, focusing on the root causes (sometimes called “upstream” causes) of injustice, competition and violence. Ultimately we work to replace the prevailing worldview with one that rests upon a much higher image of the human being, a world informed by nonviolence and the sanctity of all life. 1. Respect everyone – including yourself. The more we respect others, the more effectively we can persuade them to change…. 2. Always include ‘Constructive Programme’. Concrete action is always more powerful than mere symbolism, especially when that concrete action is constructive: setting up schools, cottage industries, cooperative farms, etc…. 3. Be aware of the long term. Nonviolent action always has positive results, sometimes more than we intended…. 5. Use Power Carefully. We are conditioned (especially in the West) to think that power “grows out of the barrel of a gun.” There is indeed a kind of power that comes from threats and brute force – but it is powerless if we refuse to comply with them. There is another kind of power that comes from truth…. 6. Claim our Legacy. Nonviolence no longer needs to take place in a vacuum. To know the history of the many nonviolent movements we referred to at the beginning, and be in touch with others involved in similar efforts today, can be very helpful (see our website for resources)…. Each of those categories has three proposed projects within the corresponding Constructive Program section. 2) With regard to Person Power, develop a tool that small support groups could use, perhaps in monthly dinner meetings, to support one another in their self-development. To my mind, AA offers a model, though I find it too complicated. A simple, easy-to-learn structure/format/method that activists could quickly use to conduct member-run groups could be easily replicated and widely adopted. The idea is that the group’s focus would be open-ended, with each member defining their own goals. Thus, it would differ from top-down “leadership training” (which can be valuable). With the Occupy Be the Change Caucus, which Michael Nagler helped to launch, we experimented some with such formats. Since then, I’ve discussed the idea on numerous occasions. There seems to be considerable support for it, but so far I know of no such tool. It would not be easy to design, but I think it could be. 3) For the outer ring in the Road Map, I would use something like “Political Action” rather than “Nonviolent Resistance (Satyagraha)” and clearly affirm your intent to focus on shorter-term winnable objectives that lead toward fundamental, systemic reform (as did Gandhi and King). I see direct nonviolent action as a tactic to be used when needed and potentially effective. In the meantime, other tactics such as letter-writing, circulating petitions, testifying at hearings, and conducting picket lines can help build a campaign. All such work can be done with a nonviolent approach that fosters nonviolence as a way of life. But nonviolent direct actions can be taken while insisting that all participants merely commit to nonviolence for that particular action, without necessarily committing to nonviolence as a way of life. So I find “Nonviolent Resistance (Satyagraha)” as the title for the outer ring to be confusing. As a child, I organized softball games. In high school, I formed a chess club. As an undergraduate, I served in most of the elected leadership positions at our 90-person student co-op at the University of California at Berkeley (where I got my Social Sciences degree). My last semester at Cal, I was nominated and elected to serve as Co-Coordinator of the experimental 150-student Residence College. Those experiences provided me with a valuable sense of community. My first taste of deep community, however, was the civil rights movement. In early 1964, I joined Campus CORE and became immersed in a series of Bay Area demonstrations protesting job discrimination — the Lucky Stores shop-ins, the Sheraton Palace sleep-in, and the Auto Row picket lines — as well as an occupation of an Oakland welfare office protesting forced workfare. Those actions focused on winnable demands, involved negotiations that led to compromise, and were victorious. In all of those efforts, I was a foot soldier. Singing and chanting on picket lines induced an altered state of mind. Putting one’s body on the line and being arrested or risking arrest provided a deep sense of solidarity. The perspective that we white folks were not merely acting for the sake of people of color, but were also acting to save our own souls, made the civil rights movement even more profound. We knew that the conventional career path was not sufficient. We sensed that we needed to overcome our deeply flawed social conditioning and become more compassionate and nonviolent individuals. For African-Americans who were involved in the movement, that perspective was integrated into their life by their involvement in the Black Church. For many white activists in the movement, including myself, that commitment to self-development was largely implicit. We did not talk about it much. But the movement’s nonviolent philosophy placed in us the seeds of a commitment to ongoing personal growth. For me, that commitment bloomed the next year. Working as an orderly in a psychiatric hospital opened my heart and an article in Look magazine about the Esalen Institute and the human potential movement inspired me. I soon became immersed in sensory awareness exercises, massage, encounter groups, and psychodrama. Having been a timid, emotionally repressed young man, I steadily became more in touch with my feelings and better able to express them. During those years, I began to explore my spirituality, inspired by contemporary theologians such as Paul Tillich, who re-interpreted the Bible into contemporary language in a way that made sense to me. I then became intrigued with the “coffee house ministry” that had been initiated by Judson Memorial in Greenwich Village in New York City and Glide Church in San Francisco. which launched the Intersection Center for the Arts. So when I applied to the Pacific School of Religion (PSR) in 1967, I dedicated myself to organizing “communities of faith, love, and action.” I envisioned such community centers as places that would support political activism as well as personal and community development. I wanted to integrate “the personal and the political.” That has been the central thrust of my life ever since. As it turned out, other students that year held a similar intent. We formed the New Seminary Movement, wrote our manifesto, and tried to take over the school. The confrontations that resulted led to several of us being expelled, only to be reinstated by the Board of Trustees. The elderly President resigned and soon the Board hired a new, younger President who helped to transform the school into a much more relevant, community-oriented institution. The next year Glide Church hired me as an Intern Minister and I moved into the Alternative Futures in the Ministry commune in San Francisco, a project for seminarians modeled after the Residence College. When after two semesters that project ended, many of us stayed together as the Alternative Futures Community, lived in a network of several households, ate a common meal once a week, and conducted intensive weekend Urban Plunges that explored the intersection of personal and political liberation. In 1971 three Alternative Futures members helped to organize the 1971 May Day demonstrations against the Vietnam War in San Francisco. At an early meeting, I proposed that we try to nonviolently shut down business in the Financial District in conjunction with the national demonstration that planned to shut down Washington, DC by tying up the bridges. The planning committee accepted my idea. But as soon as our action began, a police riot created enormous chaos. Since the federal government had charged antiwar demonstrators with conspiracy, a felony with the threat of long prison terms, my fellow organizers and I were fearful. Some of them quickly left down for several days. But I suppressed my fear, only to have it erupt into full-blown madness following an LSD trip two weeks later. My housemates had me committed to a local hospital, where I was heavily drugged and released three days later. My extreme paranoia persisted and a few weeks later I decided to reach out to the most powerful man I knew: the psychiatrist who had been my former boss in Dallas and had become a friend in the interim. He admitted me to the same hospital where I had worked. Two weeks later, he discharged me, gave me a mild prescription, told me to stop taking the drug in a month or so, and advised me to return to San Francisco rather than stay with my parents. Shortly after my return, I got jobs as an office clerk, a convalescent hospital orderly, and a mental health worker in a crisis clinic. When I learned of the formation of Madness Network News, a publication that was inspired by the work of R.D. Laing and produced by a team of mental health professionals, former patients, and others who were opposed to oppressive psychiatric practices, I helped mimeograph the first issue and became a co-editor. I felt obligated to use my experience on both sides of psychiatry to promote more beneficial alternatives. In 1974, Glide Publications asked us to produce the Madness Network News Reader, an anthology of material from the newsletter and new material. When we completed that book, I proposed to Leonard Roy Frank that we organize a political-action group to push for reform. He readily agreed and we formed the Network Against Psychiatric Assault (NAPA), which opposed forced psychiatric treatment and promoted self-help alternatives. The spiritual leader of the San Francisco Giants baseball team, right fielder Hunter Pence, is known as “The Reverend.” His teammates gave him that nickname after his memorable 2012 clubhouse speech behind closed doors that helped inspire the team to overcome a two-game deficit and win three games on the road to move on toward their eventual World Series victory. That speech prompted the Giants to include his teammates recreating it in their video celebrating the World Series. Then at the end of the 2014 season on the way to another World Series, Pence gave an incredible speech to a full house of Giants fans at their ballpark. Now it turns out, as reported yesterday in “He Might Be Giant: A Day in the Life of Hunter Pence,” Pence gets his own inspiration by reading Mahatma Gandhi and The Five Levels of Attachment: Toltec Wisdom for the Modern World by Miguel Ruiz. This method is twenty years in the making. 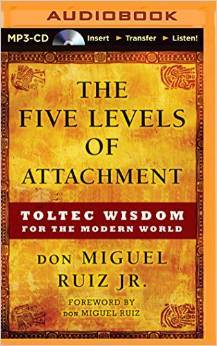 When don Miguel Ruiz Jr. began his apprenticeship into his family’s Toltec tradition, he was just fourteen years old. His first task was translating his grandmother’s talks from Spanish into English. One day, as he struggled to keep up with her, she asked him: Are you using knowledge, or is knowledge using you? Our attachment to beliefs—our own and the beliefs of others—manifests as a mask we don’t realize we can take off. But with don Miguel Ruiz’s help, and some Toltec wisdom along the way, we can return to our True, Authentic Selves, unhindered by judgment and free to pursue our true life’s calling. The Toltec culture preceded the Aztecs in Mesoamerica. Ruiz and his father are known as “naguals,” masters of transformation of the ancient system of Toltec wisdom, specifically the “Eagle Night” lineage. The five levels addressed are: Authentic Self, Preference, Identity, Internalization, and Fanaticism. Ruiz Jr. very simply lays out how our personal belief systems are conditioned from a very early age. We naturally develop preferences and make judgments as well. This book will walk readers through essays to question their own beliefs and look outside the box of their personal attachments. 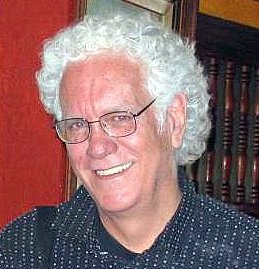 Ruiz Jr. provides simple steps for readers to take action, pausing before jumping to conclusions and giving them permission to experience an alternate story to their conditioned “attachments” that can be applied in any situation. The concepts discussed are not new, but Ruiz Jr. brings a fresh, very masculine and straightforward approach to changing thoughts and behavior that will result in powerful spiritual growth. Perhaps this kind of thinking has influenced the development of a new, less hierarchical corporate management philosophy on the West Coast and a new approach to sports coaching that has enabled the West Coast to win more baseball, football, and basketball championships than the Northeast since 2005 (seven compared to six), even though New York and Boston teams have more money. This trend began with Phil Jackson, who studied Native American spirituality closely and incorporated some of its principles into his work and formed the Positive Coaching Alliance to advance his philosophy, which he took to the Los Angeles Lakers. Pete Carroll, with his positive, player-oriented, less militaristic approach has been successful with the University of Southern California and the Seattle Seahawks. The San Francisco Giants have been famously successful as underdogs winning three World Series in five years. And now the Golden State Warriors appear to be the best team in the NBA! Maybe the West is best.